Elegant decor and jaw-dropping views make this the MOST memorable home base for your Big Sky adventures! 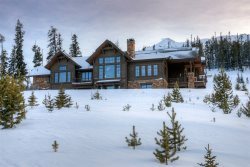 Jaw-Dropping views, elegant decor, and ski in ski out access make this the most memorable home base for your Big Sky adventure! This gorgeous custom home is built on one of the highest lots available on Lone Peak. When you walk in the front door the panoramic views of the Spanish Peaks and Madison Valley will take your breath away. This home is situated at the top of Cowboy Heaven in Moonlight Basin, granting easy access to both Moonlight and Big Sky ski runs and lifts. With 4 bedrooms plus a loft, 3.5 bathrooms, and sleeping for up to 12 people; this home is perfect for a large group or 2 families looking for an unforgettable mountaintop experience. The master suite is located on the main level, it includes a king size bed, gas fireplace, en suite bathroom with granite countertops and steam shower, a private study with a flat screen TV, and access to an outside balcony. Upstairs is a beautiful large bedroom with a queen size bed. The bathroom is located just across the hall and includes, a large soaking tub, standing shower, and dual vanity with granite countertops. Adjacent to the upstairs guest room is the guest loft area, this area includes, two (2) twin beds, a flat screen TV, and an oversized reading chair. The great room is in the center of the home, located on the main level. The great room provides beautiful views of the Spanish Peaks, comfortable leather furniture, and a grand wood burning fireplace..it might be hard to leave once you sink into the tranquility this room offers! Continuing on the main level is the chef inspired kitchen. The kitchen is fully equipped with stainless steel appliances, and any cooking utensil you could imagine! Enjoy meals together at the large kitchen island with seating for four(4) or take a few more steps into the dining area with seating for ten(10). The laughs and memories created around the dining table while taking in the gorgeous views will leave you and the crew with long lasting memories of your Big Sky adventure. Owner tip: "As the day winds down, step onto the west facing deck or dip into the very private hot tub adn revel in a spellbinding mountain sunset." The family room located on the lower level offers a wet bar, foosball table, games, movies, and a flat screen TV with DVD and Blu-Ray player. Located on the lower level is also one of the BEST features the home offers, the ski room! The spacious ski room is equipped with ski racks, boot heaters, benches, and ample storage space which makes getting on and returning from the slopes a easy and stress free! Valhalla "a LOT like heaven" is going to be the MOST memorable home base for your Big Sky adventure! Staying on top of the mountain provides you with endless activities year-round. Winter is the season in which you find yourself encompassed in a Winter wonderland, letting you forget about all other things and focus in on the tranquility and peace you will find at Valhalla "a LOT like heaven". The skiing is the BIGGEST in America, Big Sky Resort has more than 6000 acres of skiable terrain, you are sure to never get bored! Don't forget about Summer under the Big Sky! The summers offer endless activities. The zip line on the mountain, bicycling, and golf in Meadow Village. Take a five minute stroll to Lake Levinski for shore fishing, or a gentle ride on a paddleboard. The Gallatin River offers Blue Ribbon fly fishing, white water rafting, kayaking, or a mesmerizing spot for a picnic. Big Sky has many hiking trails, and adjoins the beautiful Spanish Peaks Wilderness with it’s endless trails for hiking or horse back riding, or chose a horseback ride with a fun steak dinner on a spectacular mountain meadow. This is a 5000 sq.ft. Ski in/out home in Big Sky, MT. Home has two(2) separate living areas; Great Room is located on the main level, includes a large wood burning fireplace and AMAZING views of the Spanish Peaks; Family Room is located on the lower level, includes a flat screen TV, Foosball Table, Wet Bar, DVD/Blu-Ray player, Games, and Movies. Drip coffee maker| Waffle Maker| Cooking Utensils| Dishes| Dishwasher| Ice Maker| Microwave| Double Oven| 6 Burner Gas Stovetop| Refrigerator| Toaster| Crock Pot| Etc.. Walk out the ski locker door, hop onto Cinnabar (the groomed run that runs along the backside of the house). Follow Cinnabar to the Madison Base to pick up tickets and enjoy your day from there. We recommend ending your day at the Madison Base with a beer, then taking the Six-Shooter High Speed up. From the lift make your way to Lazy Jack then catch either Powder River for easy access or Snake Bite for a bit more of a challenge. Powder River will pop you out just up the street from the house in which you can then ski down the driveway. Snake Bite will pop you out also just up the road, from here you can ski back to the ski locker room at the back of the house. If you do not end the day at Madison Base, make your way back to the Iron Horse Lift. From Iron House again, hop onto Lazy Jack, then either Powder River or Snake Bite to bring you back to the house.